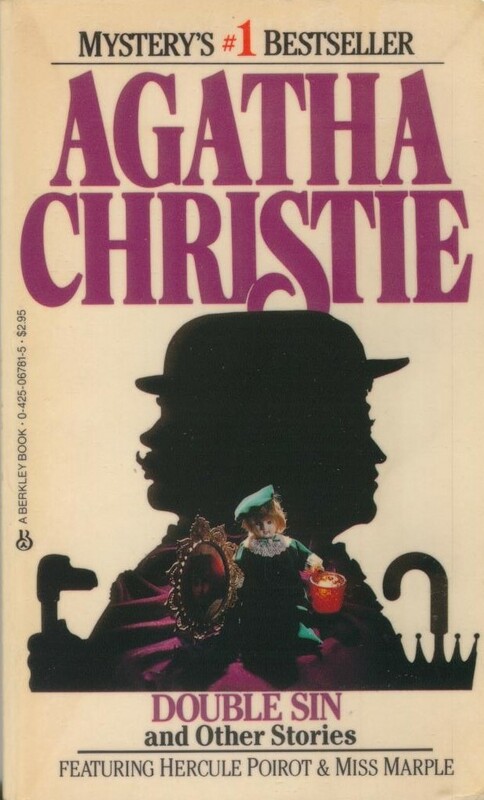 This was the very first Agatha Christie book I ever read. You can even see how yellowed the cover is! A girl in the seventh grade was reading Christie, and wanting to have something in common to talk about with my fellow classmate, I picked up this collection of stories to read. Needless to say, these stories opened up a world of mysteries and reading for me. This collection of eight stories was originally published as an American edition in 1961. The stories had previously been published in England in the 1920s and 1950s. Poirot appears four stories: Double Sin, Wasps’ Nest, The Theft of the Royal Ruby (the collection’s longest story), and The Double Clue. Miss Marple appears in Greenshaw’s Folly and Sanctuary. Two supernatural stories, The Dressmaker’s Doll and The Last Seance, round out the collection. It’s been ages seen I’ve read this book, but I remember—at the time—not liking Poirot. Probably because I found him hard to relate to. Miss Marple was far more appealing. She was a bit like my grandmother (only nicer). I also remember particularly liking The Last Seance because I was fascinated by the supernatural. Thinking back to my foundations as a reader and writer, I’m eager to do something I’ve wanted to for a long time. Re-read every Agatha Christie. After all, she is the writer that has most inspired my writing. As I began to incorporate more mystery theme elements into my own stories, I first modeled them after hers. Most importantly I’ve striven to integrate intricate puzzle plots, which Christie was best known for, with the contemporary trend and desire for well-drawn characters, which Christie has sometimes been criticized for not developing well. Stay tuned for A Return to Christie, my look at her novels and short stories (as I’m able to re-read them), on The Poisoned Martini. If you click on the image, note the price along the left side. $2.95 for a paperback purchased in 1987. It’s at least double that now!